Here’s a not-so-secret secret: I never would have gone to BEA if not for the opportunity to see Back Tomorrow: Poet in New York, an exhibit on Federico García Lorca’s time at Columbia University at the Stephen A. Schwarzman Building of the New York Public Library. I fangirl over this dead gay poet like tweens fangirl for Justin Bieber and One Direction, I kid you not. I first read Lorca’s poetry—”The Sleepwalking Ballad“— in my first college Spanish class, and I fell in love. I’ve gone through two copies of his collected poetry because I’ve broken the spines flipping through it so often. I’ve read not only all his poetry, but biogaphies, his essays on duende, letters, plays—even the obscure first one where a cockroach falls in love with a butterfly. His poetry is visceral, magical, haunting. It tugs at your soul and speaks of the secrets of the universe. Some of his most startling works are from his time in New York, where he witnessed the stock market crash that led to the Great Depression. He became critical of capitalism and materialism. He advocated for the marginalized and his poems speak of race relations in New York. The exhibit was an intimate glimpse into Lorca’s life here and shed light on the many ways the city influenced his work. Not only was Lorca a distinguished poet and lecturer, he also was visual artist, and I loved having the opportunity to see originals of many of his drawings, which are unique in style often bitingly funny. Though the gallery was small, it was packed with drawings, original manuscripts, letters, photographs, and other archival material. I spent an hour reading and taking in the exhibit. It brought me to tears. The most gut-wrenching item in the collection is a handwritten note Lorca left atop the Poet in New York manuscript at his editor’s desk. “Back tomorrow,” it said. But he never did come back. He was called to the countryside, then taken from his family’s home and murdered by Franco’s regime. After I took a moment to compose myself, I walked around the Schwarzman building, New York’s iconic 5th Avenue location. Though I had visited it before when in New York, it was before I ever dreamed of being a librarian, so I didn’t appreciate it in the same way as I do now. It’s a beautiful building. The dictionary catalog to the research collection is an impressive bookcase of leather bound volumes. You can see the bustling activity of 5th Avenue from a landing, but it’s quiet and serene inside. 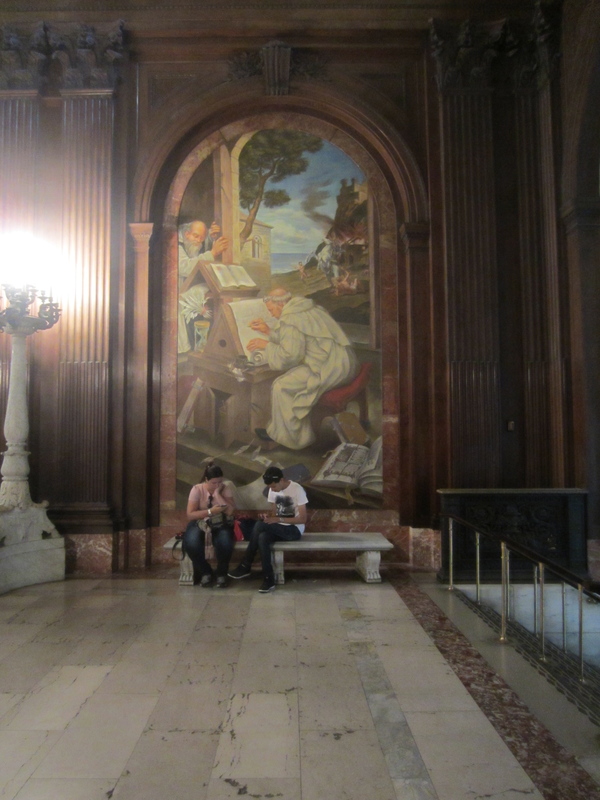 In the rotunda, where major events in bookish history are depicted in paintings, I found young people seated on benches, completely engrossed in their cell phones. (Really. There are four benches in front of four paintings, and each one was full of people sitting with their noses glued to their cell phones). I appreciated the irony. Will a painting in the future depict this kind of technology? My visit to New York Public Library to see the Lorca exhibit was definitely the highlight of my trip to the city. Are you familiar with Lorca’s work? (If not, get on that!) What’s your favorite library? You said ‘I fangirl over this dead gay poet like tweens fangirl for Justin Bieber and One Direction’ – and so am I. I love him since my fifteen years and this love grows day by day, year by year. I’ve began to learn Spanish because of him. I visited Spain – Madrid, Granada, Toledo, Malaga, Burgos – six times. He brought me to Buenos Aires. He’s a magician. I also thank our interpreters, russian translations of Lorca’s poetry are wonderful. Thank you for this report, it’s gorgeous. I often tear up when I hear or read about last words or impressions people made right before something important happened. I had never heard of Lorca until I saw you mention him once before. I will check out some of his poetry from the library. I have too many favorite libraries but they all have things I love and things I hate…er, rather, I don’t like very much. Even today, I thought about how picky I am about libraries. I went to my closest branch (Kenmore Library, part of the King County Library System) and I decided not to stay because the floor to ceiling wall of windows was making it too hot in there for nitpicky me. wah-wah-wah. The story of his final note is very moving. Thanks for sharing it with us, Molly. I love how he signs his name. I always laugh a bit when I see people so into their phones/technology that they can’t appreciate the world right in front of them. I was at an exhibition at the Fondation Pierre Bergé-Yves Saint Laurent last year, and sat beneath an iconic portrait of Proust was a kid on a Nintendo somethingorother…sigh. Not that I expect a 10 year old to be into Proust – but if your parents have dragged you all the way to Paris, it’s a shame that your memories will be of High Scores rather than the city.